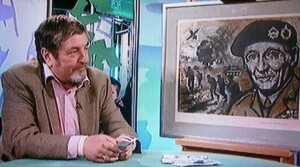 A signed print of Field Marshal Montgomery of Alamein and painted by J Lawrence Isherwood was featured on “Dickinson’s Real Deal” TV show from Lancaster, screened on 14th May 2010. The large print – one of a limited edition of just 75 – was bought almost 30 years ago for £300. Amazingly, when antiques dealer Mike Melody offered the seller exactly the same amount he’d originally paid, the gentleman took it. Mr Melody – known to be an Isherwood fan – may have tipped up more if the seller had been more pushy and confident. But it seems he was satisfied just to get his original payment back. Mr Melody told viewers that Isherwood’s work is becoming more and more popular and after shaking hands on the deal, said he would not be selling the signed print but keeping it on his wall at home.